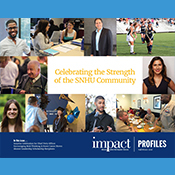 Impact is the SNHU alumni and donor magazine, featuring stories of alumni and current students doing extraordinary things with their education, and the faculty, staff, and donors who inspire them. It is published biannually. View the most recent issue online, or reminisce through the archive of back issues. 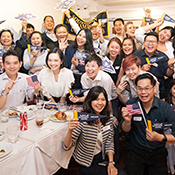 The Office of Alumni Engagement sends a monthly e-newsletter to our alumni and friends with details on upcoming events, university news, alumni updates, and much more. You can always view the most recent edition online. Update your communication preferences to stay in-the-know. 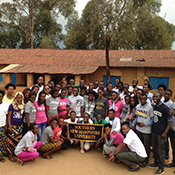 The Office of Alumni Engagement sends a quarterly e-newsletter to our alumni and friends who have indicated interest in volunteering to help the SNHU Community. 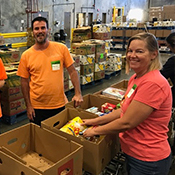 Check out the latest update online. Need to update your interests? Complete our short online form to tell us how you'd like to get involved. A lot can change in 12 months, and we're no stranger to that at SNHU. Every December, we compile some of the most remarkable SNHU stories from the last year for a Year in Review.